Gioconda Soft Pastel Pencils offer the smooth finish of conventional pastels without the mess. They are highly pigmented, with a buttery smooth feel, and have excellent blending and toning characteristics on dark or light surfaces. All colors are lightfast and fade resistant. 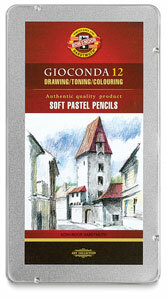 Gioconda Pastel Pencils also feature California cedar wood casings for crisp and accurate sharpening with minimal waste. They are available, packaged in sets in metal tins, in a full range of colors. Pencils are pre-sharpened. This set contains Zinc White, Violet, Permanent Green Dark, Lemon Yellow, Violet Red, Olive Green, Zinc Yellow, Bluish Violet, Olive Green Lights, Chrome Yellow, Ice Blue, Sienna Natural, Light Ochre, Berlin Blue, English Red, Naples Yellow, Light Ultramarine, Sienna, Gold Ochre, Dark Ultramarine, Indian Red, Flesh, Ultramarine Medium, Roedeer Brown, Light Orange, Cobalt Blue, Caput Mortuum Dark, Dark Orange, Azure Blue, Van Dyke Brown, Vermillion Red, Paris Blue, Caput Mortuum Light, Light Vermillion, Permanent Green Light, Light Gray, Old Rose, Chromium Oxide Bright, Mouse Gray, Carmine, Grass Green, Pearl Gray, Light Violet, Chromium Oxide Green, Steel Gray, Carmine Madder, Hookers Green, and Bone Black.